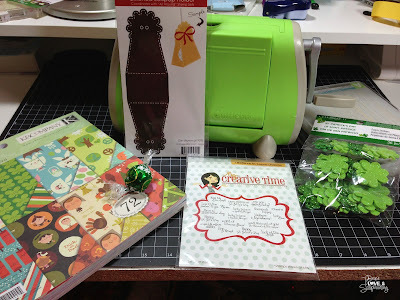 I am so sorry, being a day late on the craft post. I am having a hard time bouncing back from the four day weekend. Can you believe it is December 1st already. AAAGGHHHH! 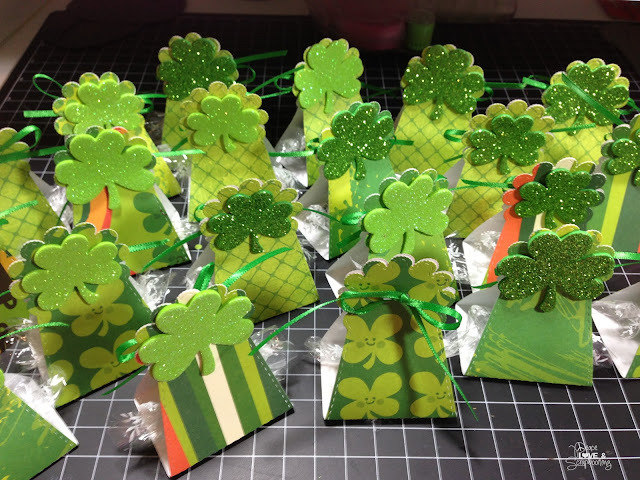 Today I wanted to share with you some invitations that I received this week that are so cute. 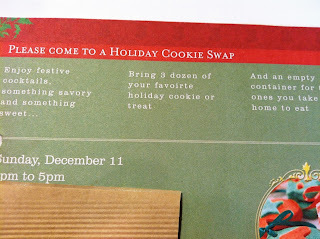 The first is an invitation to a cookie exchange. And an empty container for the ones you take home to eat! On the bottom section of the invitation is date, time, addressed (covered up) and RSVP information. It has really nice ribbon tied in the center of a hole punch. The ribbon is red with white glittery 'Merry Christmas" on it. So appropriate and adds just the right touch. The back of the invitation (and what the printed paper is adhered to) is a recipe card. 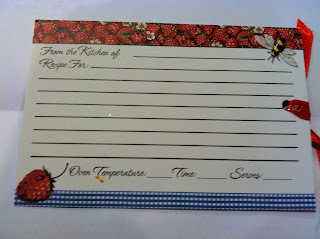 I just think this idea is so adorable - a perfect, quick and easy invitation! The other invitation in the mailbox this week was to an annual neighborhood party. 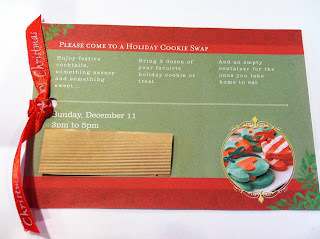 My neighbor made her invites too - and they are fabulous. 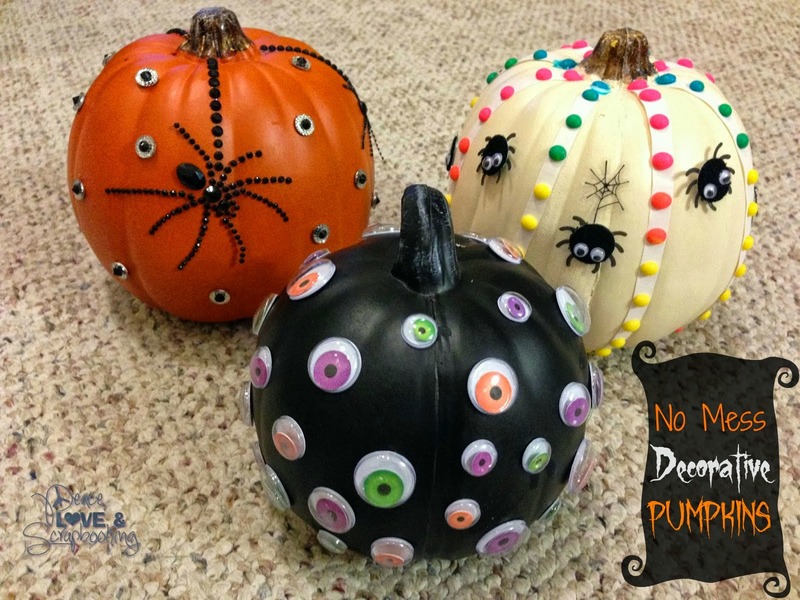 I think they are pretty to easy to make as well. 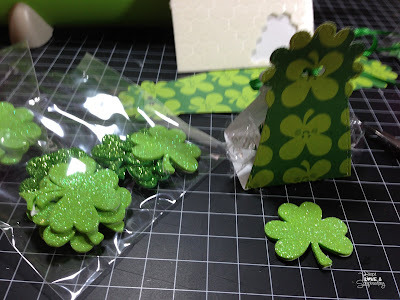 This is lime green glitter paper (about 4x6) with a white piece of paper adhere on the glitter paper. The white paper is printed with red ink. The invitation has all the pertain information: event, date, time, place and RSVP information. 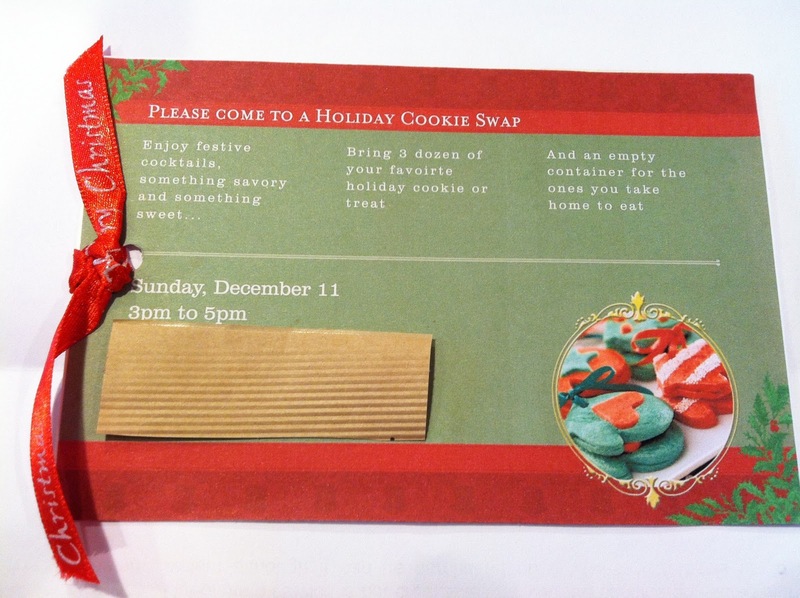 Added at the top of the invitation is a candy cane embellishment. 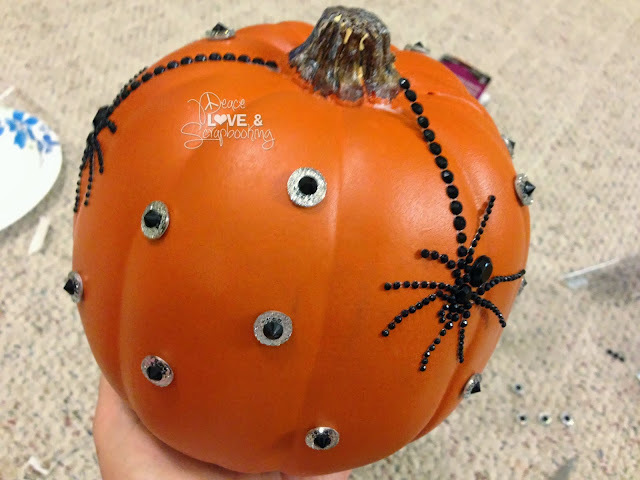 You can purchase the embellishment (or similar ones) at Michael's, Joann's or AC Moore. Another super easy, but festival and professionally looking invitations. 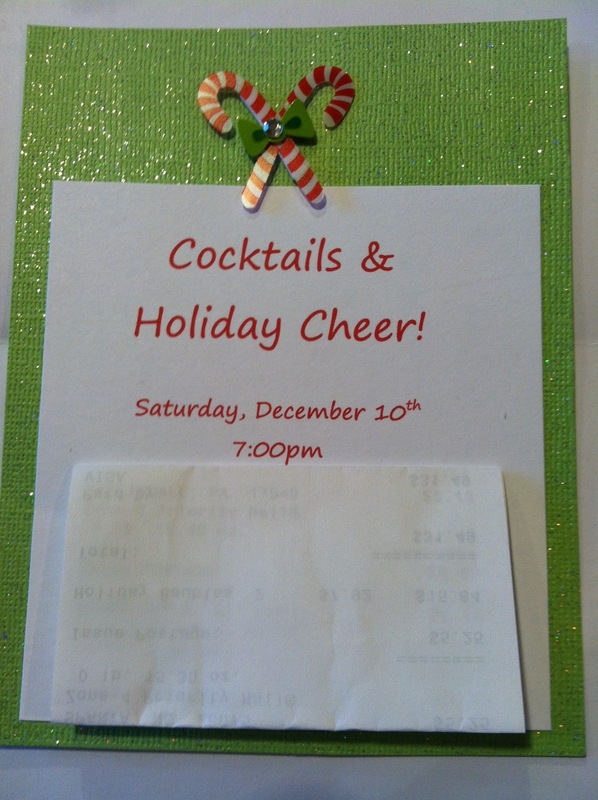 So if you haven't' gotten your holiday party invitations out - this weekend would be the perfect time to work on them. 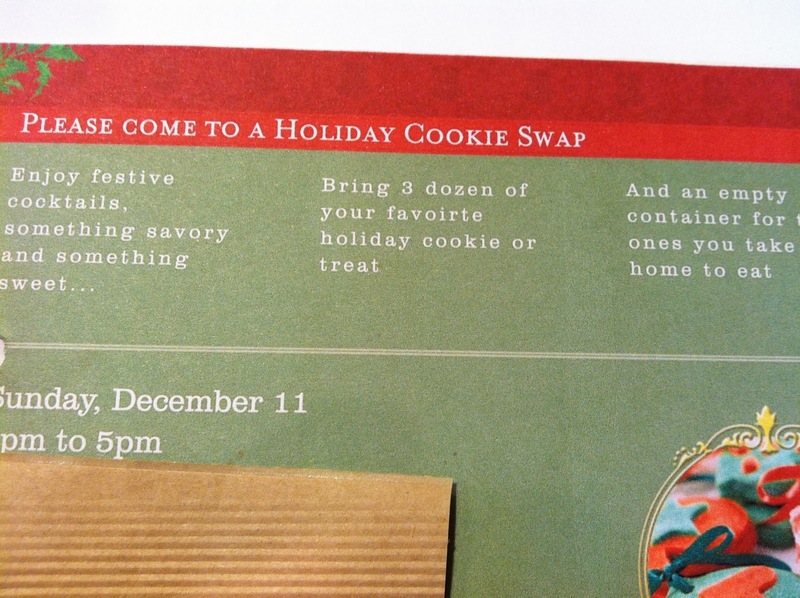 How about organizing a cookie exchange with neighbors, good friends, co-workers, and other friends. 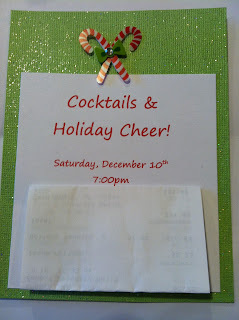 Think how much fun you can have and the invitation above is so "theme" perfect! Thanks for stopping by today! Have a great weekend working on your holiday invitations! I originally posted at Outnumbered 3 to 1. I love, love, love Halloween! Every year we host a Halloween party and this year I decided I needed some new decoration. I decided to decorate pumpkins! This was so easy. I started with 3 plain pumpkins purchased from Michael's and Target. 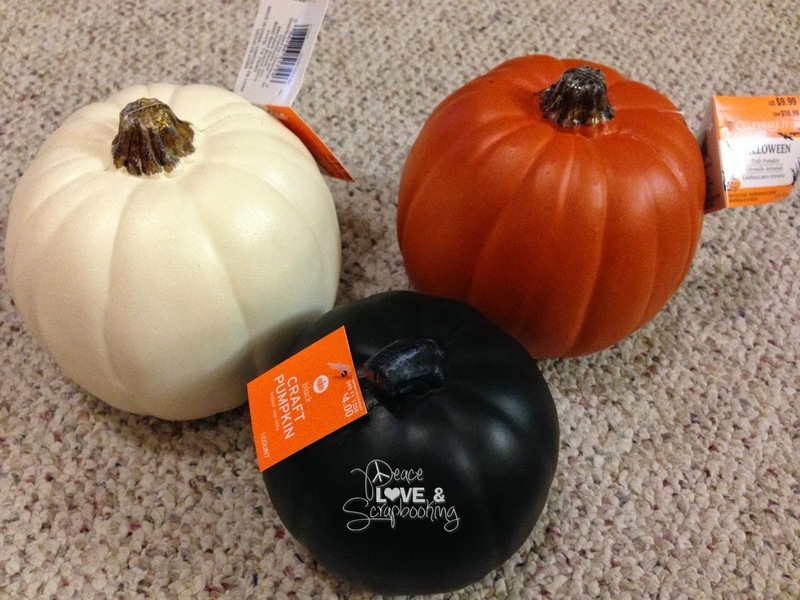 I purchased my decorations at Michael's too. 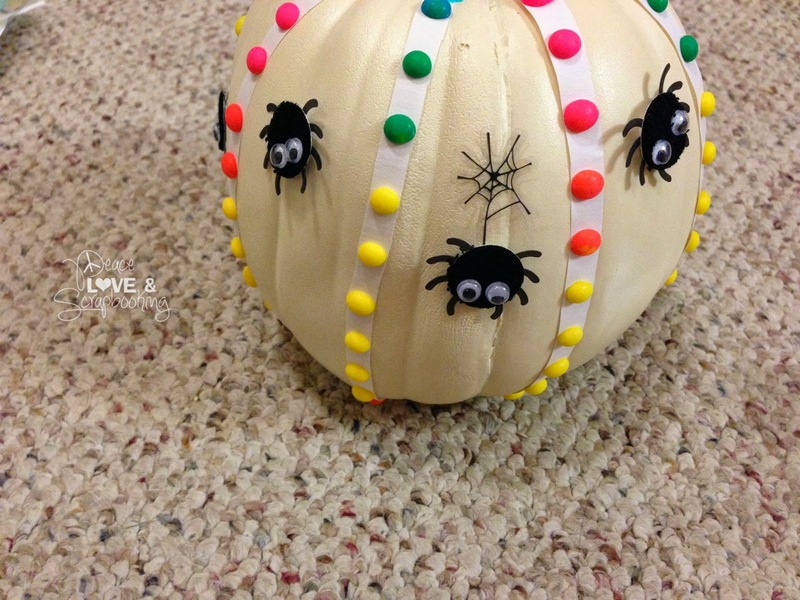 I started with the white pumpkin and the candy buttons. I cut the strips into single rows and put a thin layer of glue around the stem. I attached the strips of candy buttons to the glue. 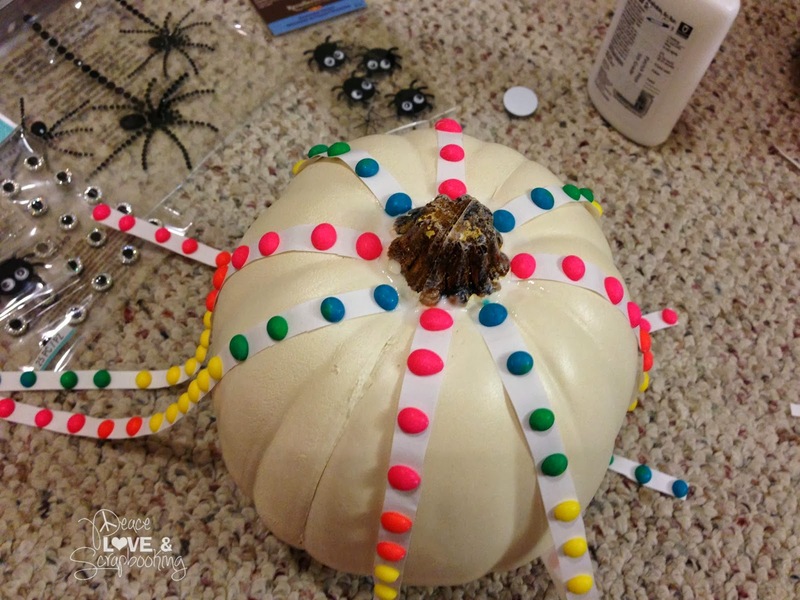 I taped the end of the strips to the bottom of the pumpkin. 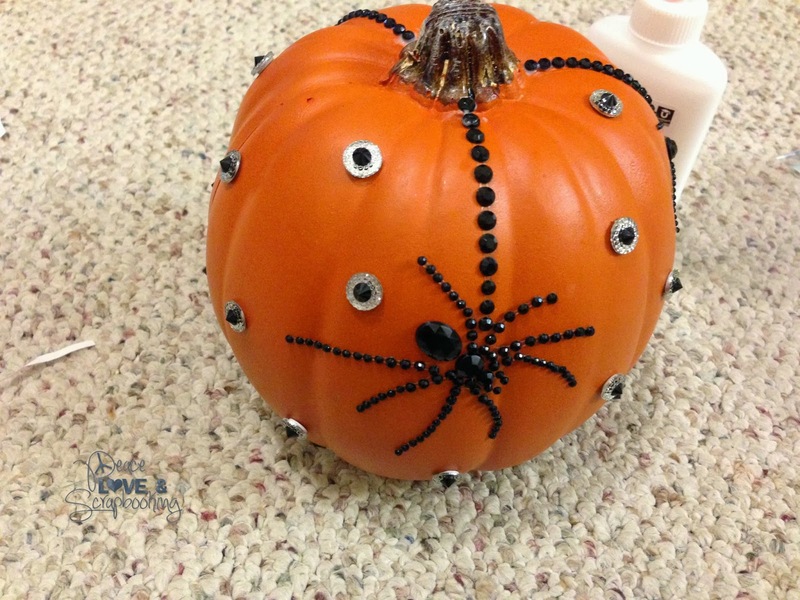 I added the spiders with google eyes to it. 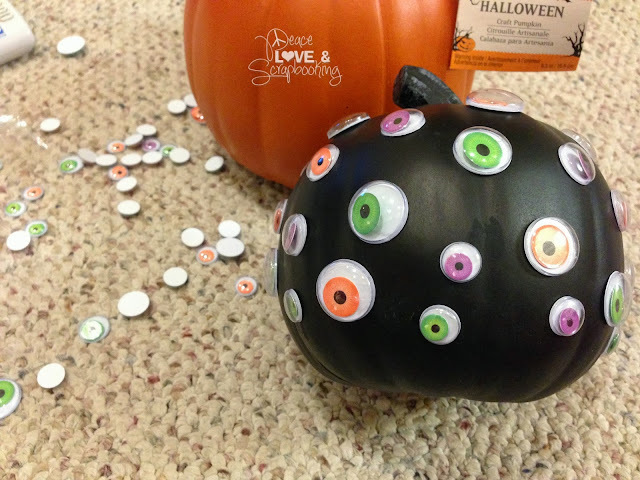 I moved on the black pumpkin next and glued the google eyes to it. I randomly selected the size and color and just glued them on. I didn't over think it. 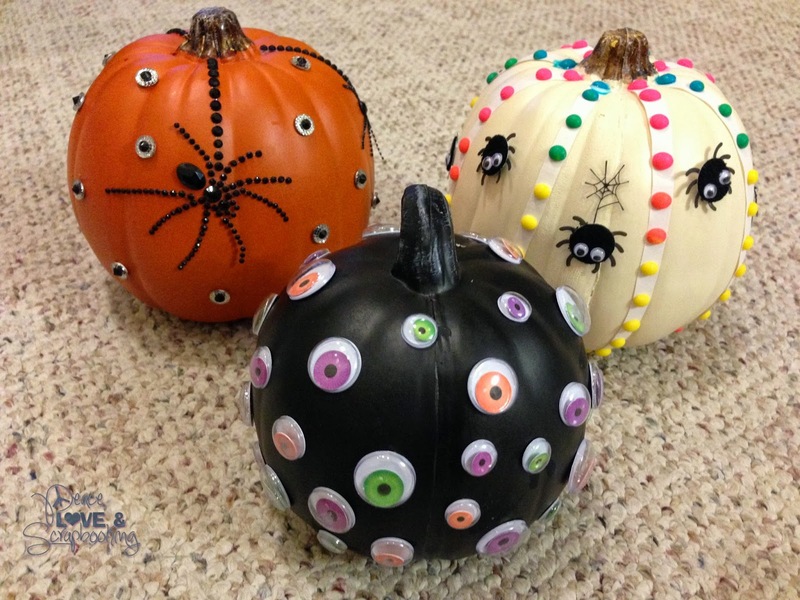 Moving on to the orange one, I added three spiders and glitter gems that reminded me of eyeballs. Here are all three of them together. Don't they look great? I originally posed on Outnumbered 3 to 1. Even though school is still over a month away in NY, I know many other parts of the country are getting ready for back-to-school. 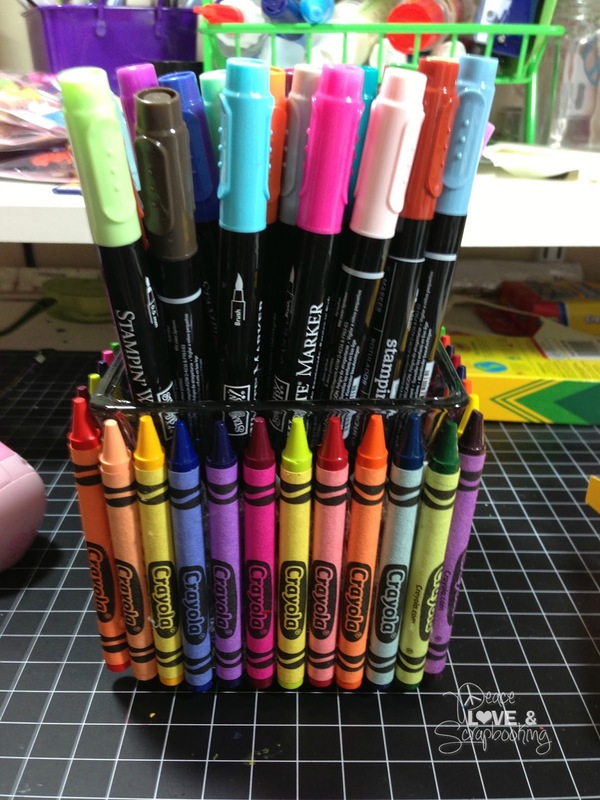 I was inspired by crayons being on sale (25 cents at Staples!). Lay out the crayons in the order you want them to be glued on the side of the container. 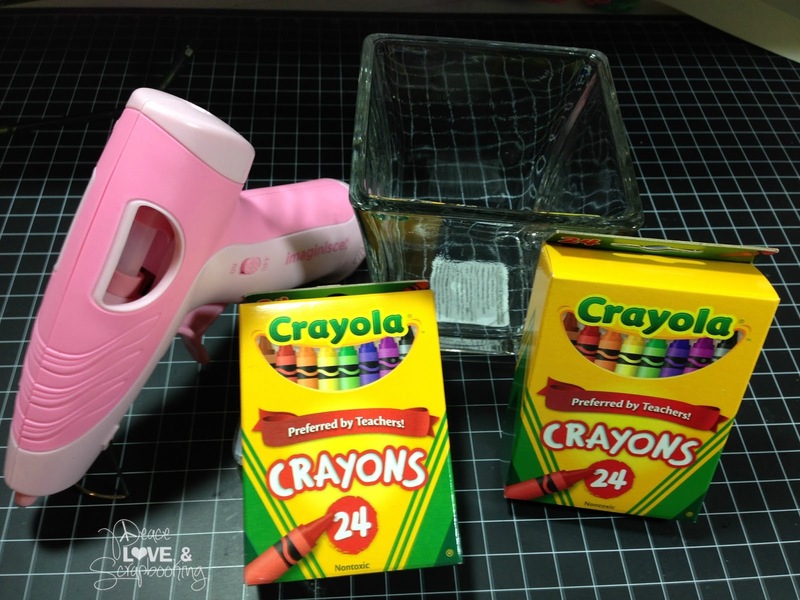 Once the glue gun is heated, carefully apply glue to one side of the crayon and place it on the container. 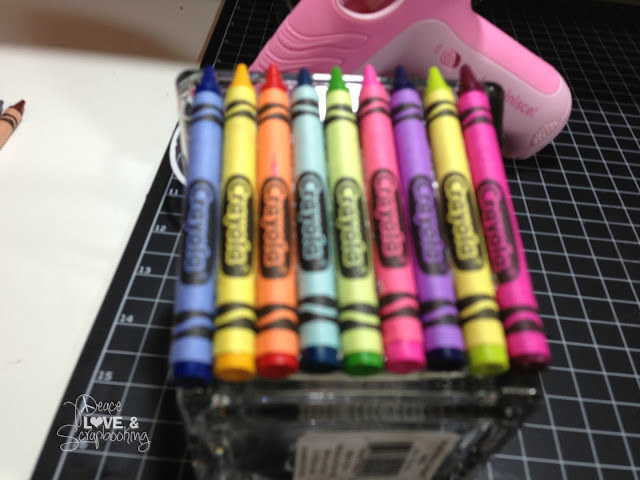 Remember hot glue dries quickly and is VERY hot to the fingers! Keep repeating until the side is completed. Repeat three more times, until all four sides are completed. 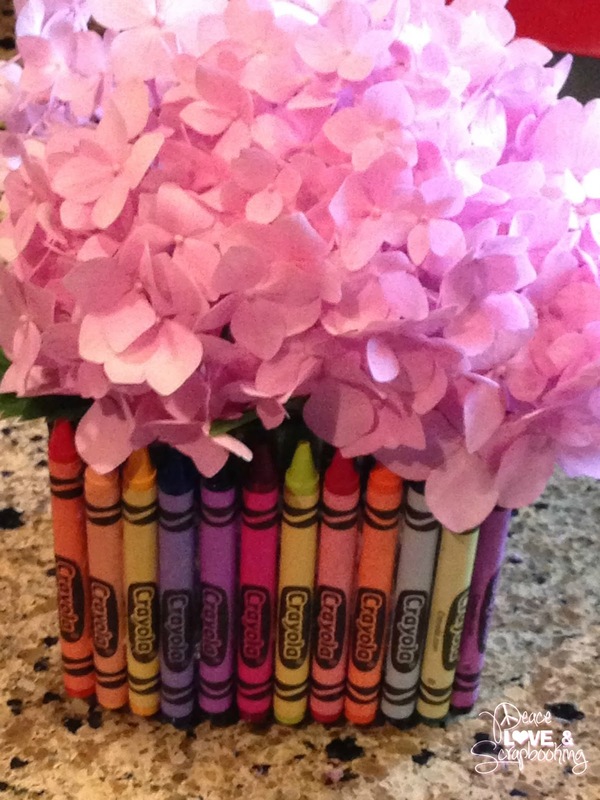 I like adding flowers for the first day of school. I also include in a separate bag, pencils, pens and "marbles/glass pebbles." I include a note, that explains: once the flowers have died, use the marbles/glass pebbles as a filler in the container to hold the pens and pencils. How simple is this? 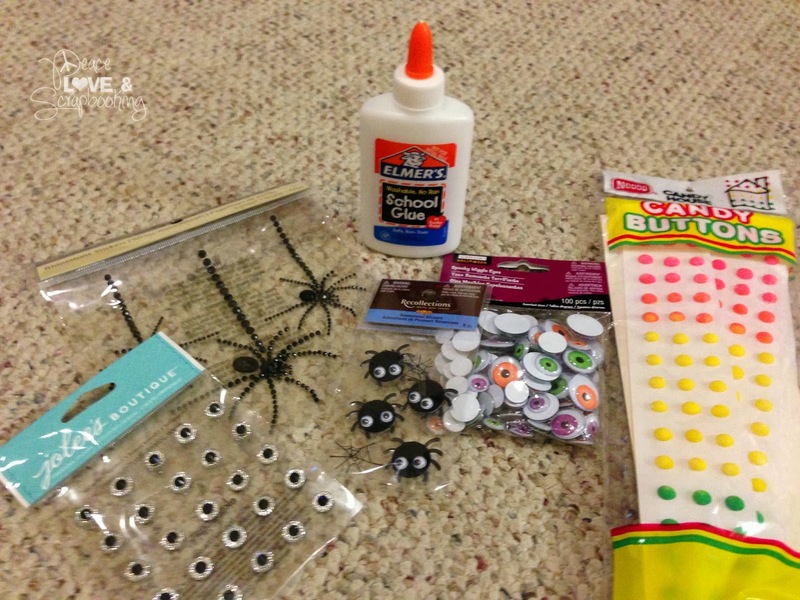 I would love your feedback on this back-to-school "craftastic!" I posted this originally at Outnumbered 3 to 1. 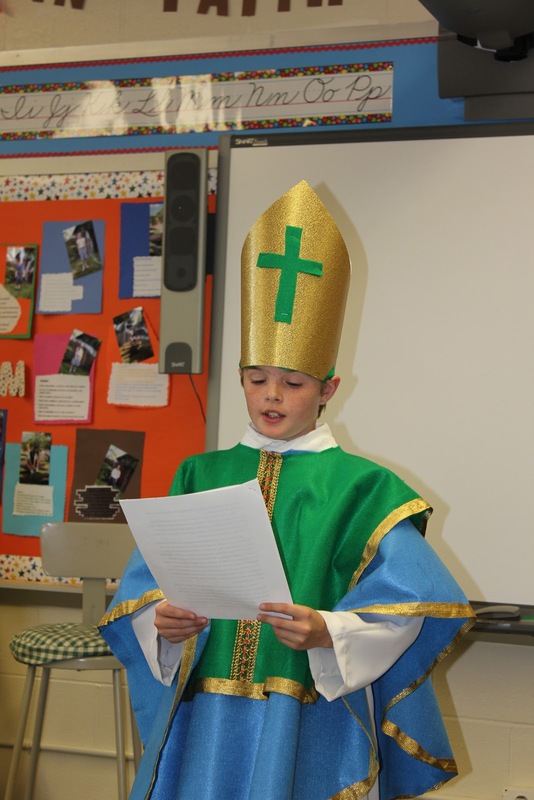 My son had to write a report on his favorite Saint as a class project. He chose St. Patrick. When I saw the requirements of the report - must dress as your Saint while giving oral report......I gulped, broke out in a cold sweat, slept on it and hit "google"! With a photo of St. Patrick, off to the fabric I went....with my son in tow. White Sheet - Twin top sheet (I had one that I bought for $4 when I was going to make a ghost for my front yard). You can also go to goodwill, find a clearance white sale, or buy cheap white fabric (probably your most expensive option). NOTE: I did not mention a sewing machine....you do NOT need one! Fold the sheet in half and hold it up to the child. 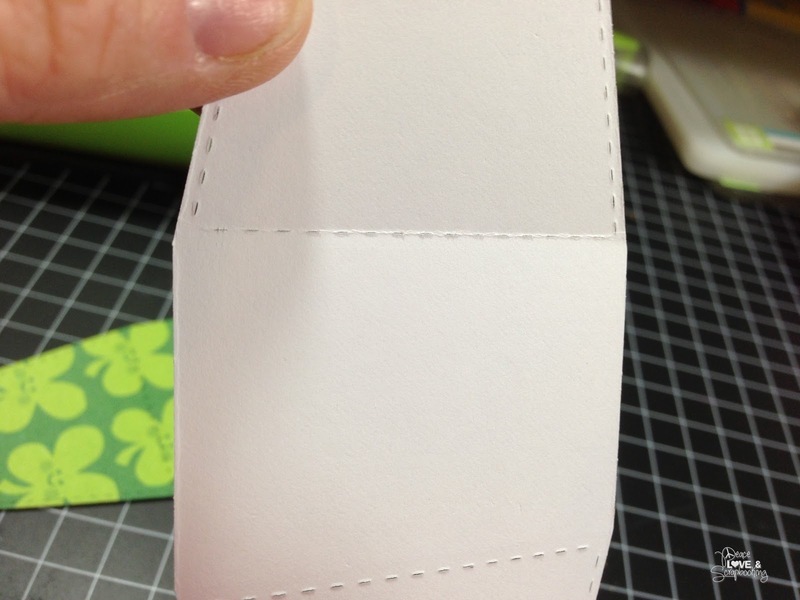 Make a cut on one side (near shoulder) and another cut on the other side. Now cut a half circle, starting with one cut and ending at the other. 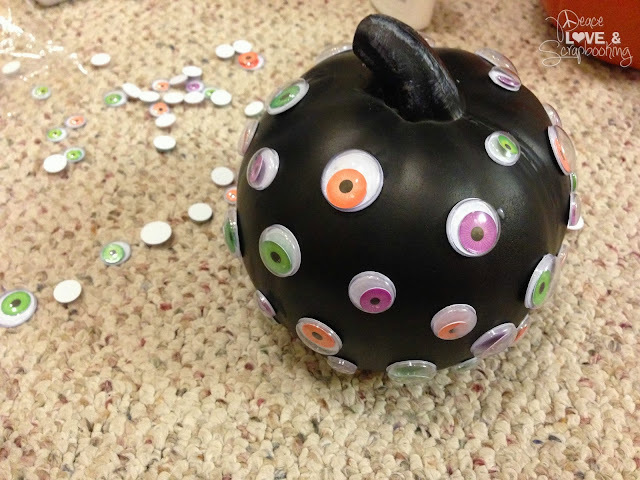 This will make a hole for your child to put their head through it. Have child stand on chair and cut the front and back to appropriate length. It is fine to have the bottom of pants and shoes showing. You don't want anyone tripping. Repeat with light blue felt and kelly green felt. While child is on chair cut the light blue felt anywhere between the knees and mid-thigh. Also, curve the corners. Don't stress over this and just eyeball it all. No one will able to see if it is not perfect. When cutting the kelly green felt, you want it to be close to the child's waist. Again, curve the corners. 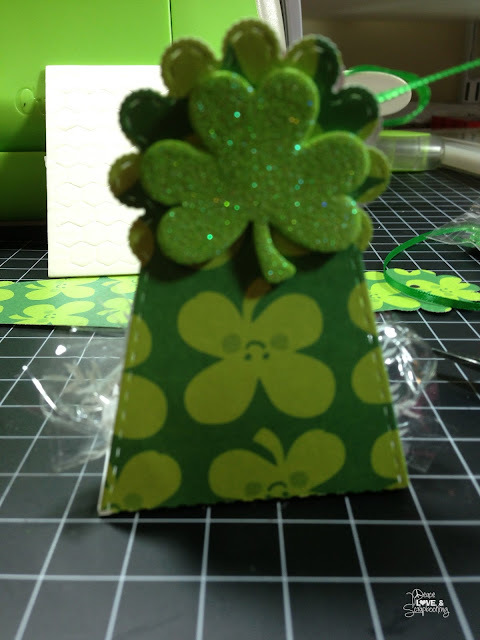 Take the wide flat gold ribbon and start stapling around the edge of the light blue and kelly green felt. No one will see the staples. 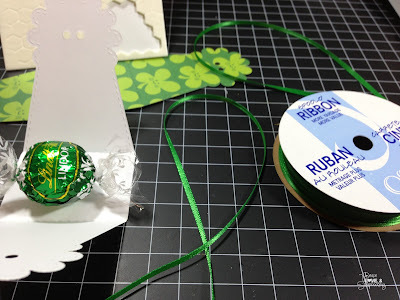 Take the flat braided gold ribbon and staple it down the center of the green felt. To make the "hat" I took two 12x12 glitter gold sheets of paper and placed one on top of the other and cut one corner off (both sheets). Next I lined up the paper and stapled it so the edge that sits on the head were lined up and stapled it (one side only). Holding the paper (two sheets stapled together), I held it to my sons head and joined the other side and stapled. Cut a cross out of left over kelly green felt and staple it on the "hat." I put little pieces of green felt where the hat rested on his ears to make it more comfortable. 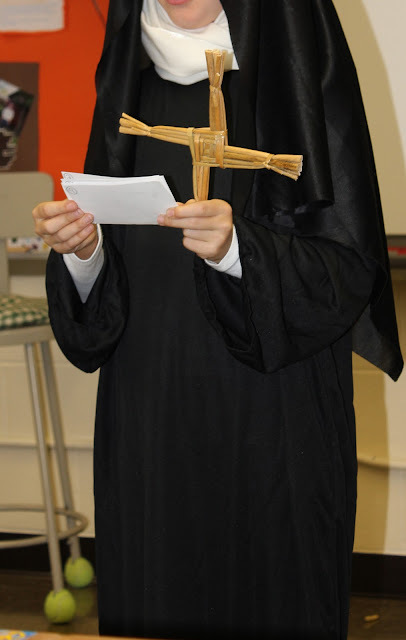 For all those holiday shows coming up soon, there are several other costumes that are easy to do. 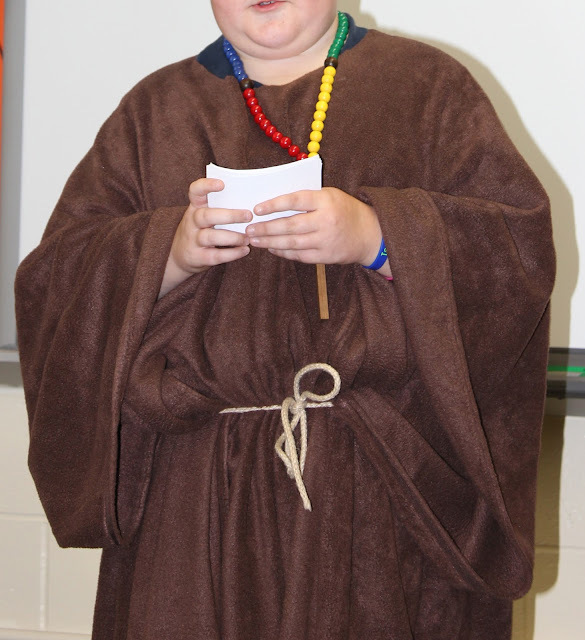 Need a Shepard in your show? Take a brown sheet (instead of white) or brown fabric and do the same thing. Belt with a piece of rope or twine. Tuck the corners into the belt and you create "sleeves!" Take the left over sheet or fabric and drape over the head. You can tie a piece of rope or twine around the head if you want. For girls, you can do the same thing with a black sheet or piece of fabric. Where a white shirt underneath (or turtle neck). Wrap a white scarf around the neck - done! Have a black dress? How about a brownies vest and a white shawl? If you answered yes, here is a simple costume for a girl. You can't even see the brownie patches! Need Mary in your holiday show? This too is a very easy costume. This was put together at our local goodwill store. 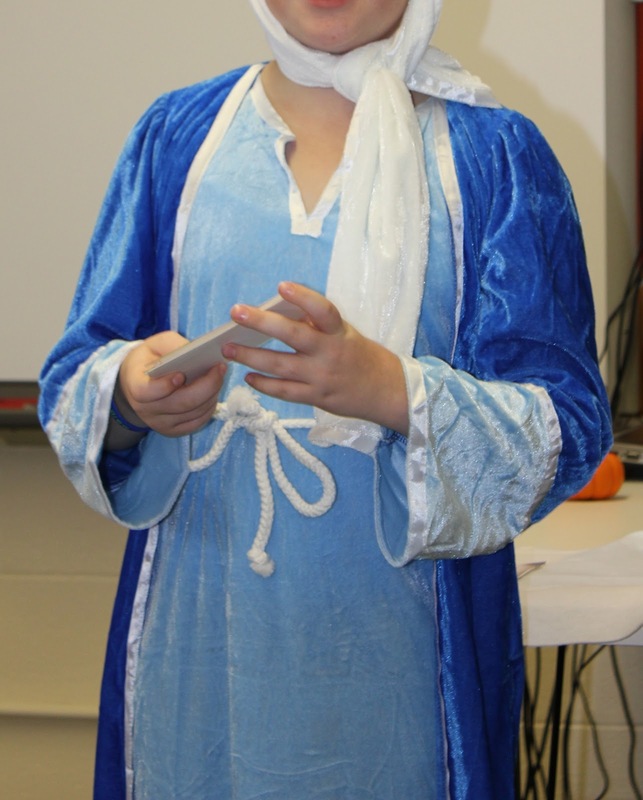 We found a light blue night gown and a blue robe. 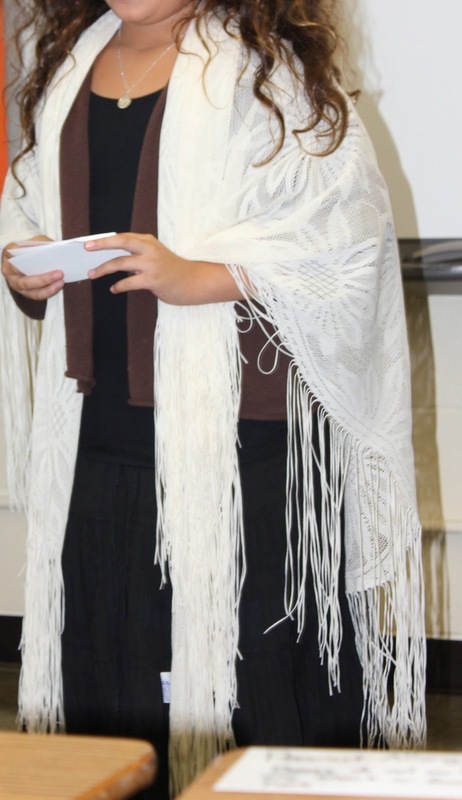 Belted it with a white rope, put a white scarf around her head.....and we had Mary. Creating costumes for all the holiday shows coming up shouldn't stress you out. Think of what you need and the easiest way to find it. Remember, a stapler is your friend - you really don't need a sewing machine or glue. Keep in mind the audience will be a distance away and won't even notice. Their focus is on the performance! I posted this originally on Outnumbered 3 to 1. I was feeling "festive" and my team has been working so hard at work, I wanted to make something fun to say thank you! 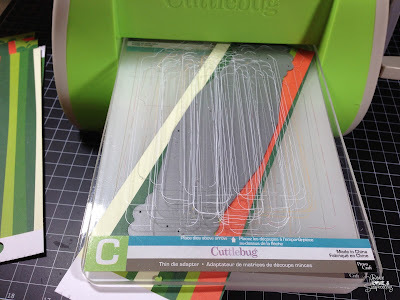 Using the Lollipop Holder Die, and Cuddlebug, I "cut" the holder out. I used 4 different patterned paper. 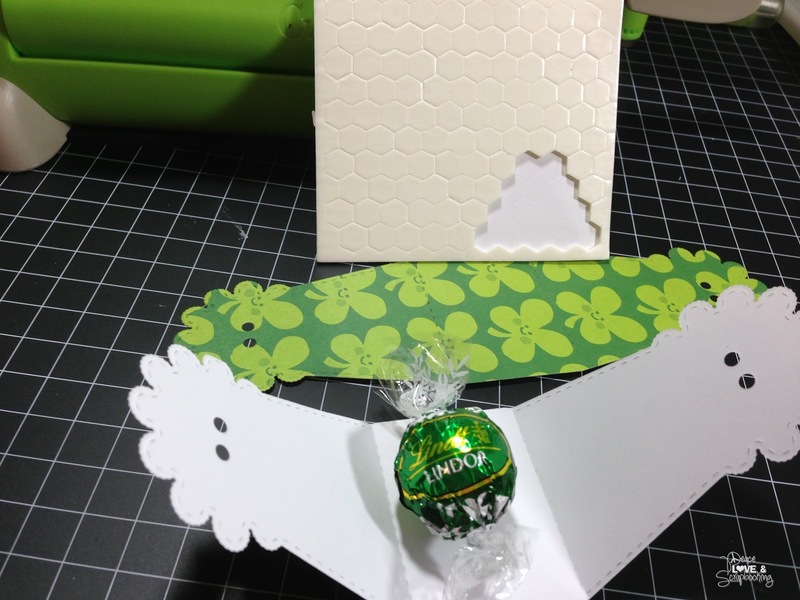 As you can see the Die perforates the Lollipop Holder for you. No need to score. With a pop-dot from Stampin Up, I adhered a Lindor Mint Truffle inside. I have always seen lollipops being used with the Die, but we don't eat lollipops at work! 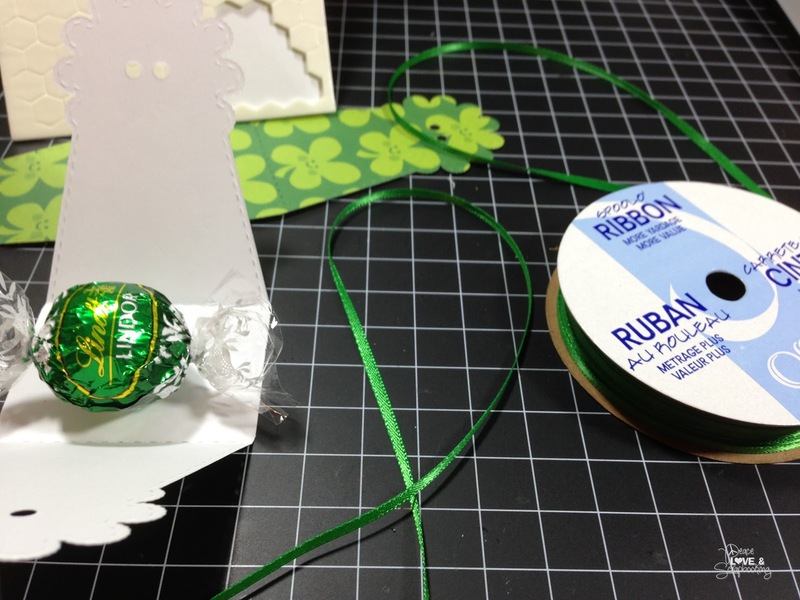 Next, I cut thin kelly green ribbon and put it through the holes, tying a bow. 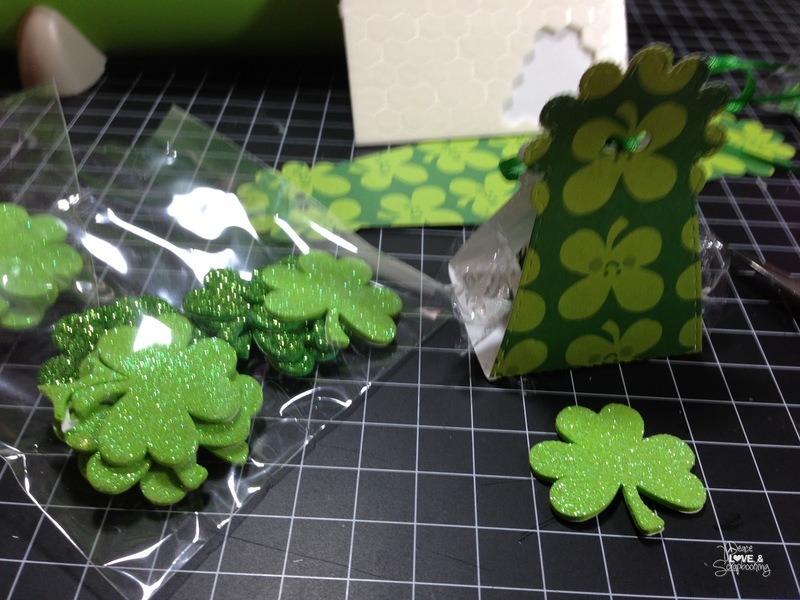 On the non-bow side, I stuck a glittery green shamrock! 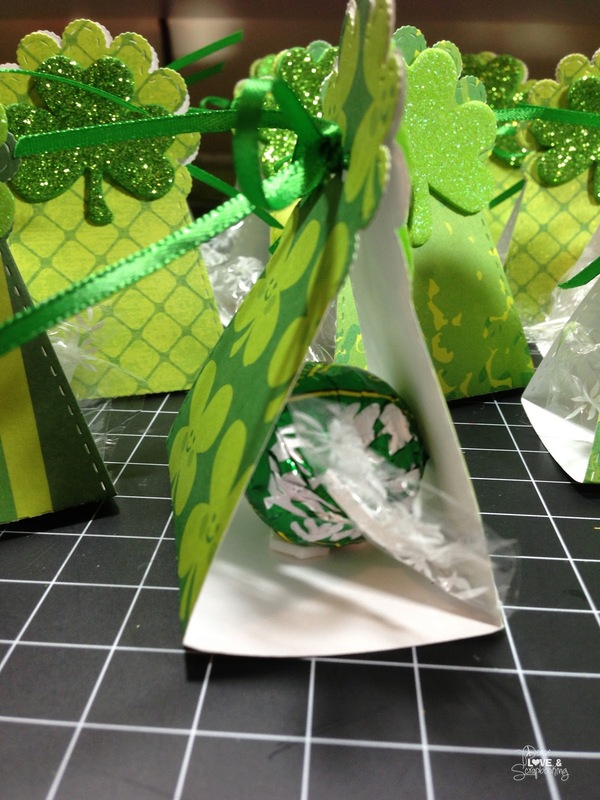 I can't wait to give these little treats to my team Friday!